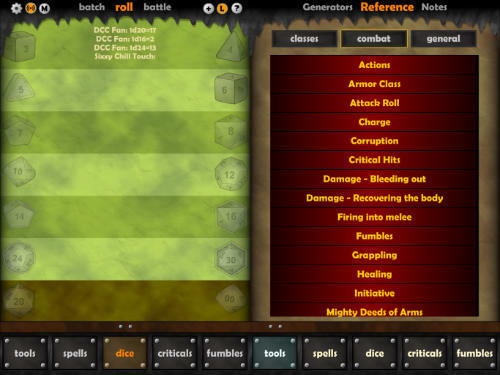 Beginning in the early days of the Dungeon Crawl Classics RPG beta, Purple Sorcerer Games has created free tools and helpers to make it as easy as possible for new and experienced players to get into the game. We're thrilled that so many DCC players from around the world rely on these tools, and look forward to building new utilities for years to come! tourney style character in moments. Create up to 50 PDF sheets or plain text characters with one click! Millions of butchered peasants can’t be wrong! 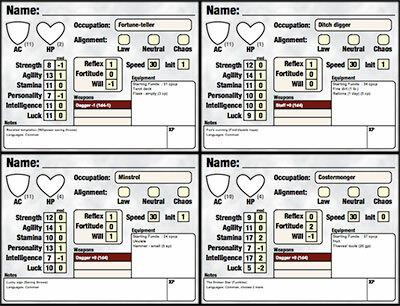 The Upper Level Character Generator will create higher level characters in PDF or plain text: up to 50 at a time! The Mutant Crawl Classics Generator will spit out mobs of mutants, plantients, manimals, and pure strain humans to die in the radiated wilderness of a long-fallen world! The Ennie-Award winning Crawler’s Companion handles all your funky dice rolling, chart searching, rules referencing needs! 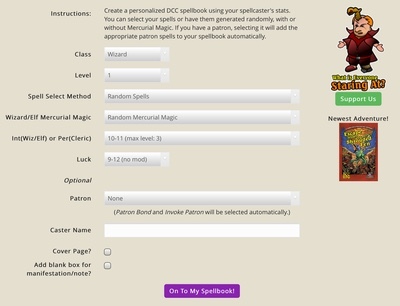 Create entire spellbooks with a single click. Either choose your spells, or have them picked randomly, with or without Mercurial Magic! Use these simple generators to create random Demons, Dragons, Mercurial Magic results, Magic Swords, and Unique Monster Traits. 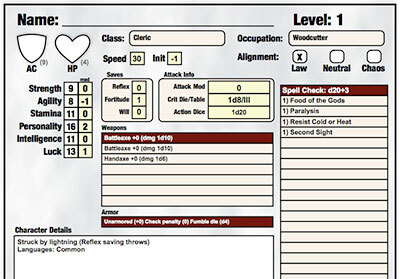 Download Useful Charts for the 0-level DCC RPG Enthusiast to print out for your players.